Description: No Name Horses is a Japanese all-star big band formed in 2004 under the leadership of internationally renowned pianist/composer/arranger Makoto Ozone for a recording project to back up the Japanese singer Kimiko Itoh. The album was a huge hit in Japan, and everybody in the big band felt that there was something special, so they continued to perform, rehearse and record together, so far producing three successful albums. Back At The Club - In Tribute is their fourth, and first live album. Instead of Ozone's original compositions and arrangements, they decided to do "big band classics" componsed and/or arranged by Thad Jones, Sammy Nestico, Frank Foster and Horace Silver. AND, they gave themselves only ONE chance to perform and record each tune in front of a live audience at the Blue Note Tokyo jazz club! Well-known arrangements, part of important reportories of famous big bands, are transformed by this modern big band with incredible technique and precision. The excitement, swinging, and "fun" aspects of jazz are energetically nad passionately expressed. The CD's sound--mixed by GRAMMY-winning engineer Joe Ferla and mastered by Greg Calbi--is exceptionally good, too. Highly recommended for fans of big band jazz! Produced by Makoto Ozone. 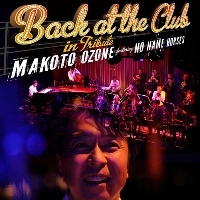 Recorded live at Blue Note Tokyo, August 27 through September 1, 2010.